September sings its song again. Today that song is rain, rain, rain. 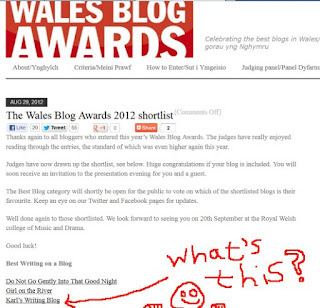 But it's not all grey light glooms as I serve a piece of cake and some tea to my guests; I'm on a shortlist for The Wales Blog Awards 2012! Specifically, one of the three finalists in the 'Best Writing on a Blog' category. The three nominated blogs are all very different in style and subject so it should be an interesting decision for the judges: good luck to all of us. We'll find out the winner on 20th September at an awards ceremony in Cardiff. Keep an eye on the blog for the awards, since the event might be streamed live on the night. You can also vote! There is a People's Choice Award for whichever blog receives the most votes. I'm not as high profile as many of the other blogs, but if you think my blog is worthy of your patronage, and you want to be promoted to a rank which entitles you to a choice of lemon drizzle cake or cherry coconut cake then please consider voting for me! Your blog is always interesting, so I voted. Now I can't decide which cake to have. Maybe a half slice of each? Thanks. And good luck with the award! Hi Bec, many thanks! The cake is a hard choice for me too: chocolate would win every time, but the chef wanted to try something else. There's also some lemon shortbread I baked last night, which is nice but best with a cup of tea so it doesn't gum up your mouth. I'll be posting a new short story on Thursday, which is in a different setting from my normal fiction. Congratulations Karl. Fingers crossed for Thurs 20th! I better remember to vote. Doh I missed the vote! If you lose by one vote, come and swear at me!